An idea person. A systems thinker. A creative strategist. A disrupter. There are many ways to describe and define a successful product manager. At its core, product management brings creativity and strategy together to see new products from conception to launch. For both physical and virtual products, product managers define consumer needs and business objectives and translate them into viable, innovative products. In short, product managers bring ideas to life. Simply put, product management is the process of setting the strategy, roadmap, and features for any new product to market. The product manager is somewhat unique to the digital age—think of it as an evolution of a traditional brand manager at a consumer packaged goods company. A product manager is responsible for the development of digital or virtual products, including maintaining product roadmaps, establishing and communicating product requirements, overseeing usability testing and prototype development, prioritizing features, writing enhancements, and defining and tracking metrics. Phew. That’s a mouthful. But with the proliferation of software-as-a-service (SaaS) companies and digital apps, there’s more demand than ever for qualified product managers to keep pace with the demand. From entry-level product owners to Chief Product Officers (CPOs), product management presents a wide range of career opportunities for anyone interested in building a digital product from the ground up. There’s no set or defined path to become a product manager. Successful product managers can come from many different backgrounds, technical or non-technical degrees, MBAs to fine arts majors. In fact, that diversity in thought can lead to more innovative collaboration and better product outcomes. However, aspiring product managers can prepare themselves for the role by honing the following five skills. Too often, modern employees don’t have time to think strategically about their work. In fact, research shows that 96% of workers say they lack time for strategic thinking because they’re too buried in the day-to-day responsibilities of their job. That makes a strategic mindset that much more critical. The ability to quickly and easily spot patterns and set your vision about a product will ensure teams are aligned and working toward a common goal—and the final product you develop is created with a clear, strategic purpose in mind. Solid communication skills are critical to success in almost every personal and professional situation. And visual communication skills are especially imperative to product managers who need to clearly and quickly communicate big ideas to cross-organizational teams. In fact, people following directions with illustrations do 323% better than those following text directions alone. User flows can help product managers clearly communicate functionality to UX and designers. Though they can take some time to build, user flows are essential because they can act as a reference point and living source of truth for any product development project. Product management and project management are related, but not interchangeable. Rather, successful project management skills are needed to ensure teams adhere to a product development roadmap and implementation goes off without a hitch. It’s all in the details—and the quickest way a product manager can derail a project is by not paying attention to critical milestones, communications, or deadlines. Effective resource allocation and delegation is also a critical part of project management. From the C-suite to the UX design team, product development involves extensive collaboration across teams and roles—and it’s on the product manager to streamline communication, optimize workflows, and ensure everyone is moving toward the same target. The type of product, the people who use it, and the type of company will determine how technical a PM needs to be. For example, a data science product with machine learning algorithms and APIs requires a level of expertise to understand not only how to build the product but also how to talk credibly with the customers who will use it. Beyond specific product requirements, however, the best product managers have a basic understanding of software development cycles, A/B testing, product engineering, and analytics measurement platforms. A good product manager should be able to describe their users’ goals and work on a product roadmap to meet those needs. On small teams, product managers can function as a defacto UX designer and must be able to confidently communicate with design teams about common design patterns, usability preferences, and user behaviors. Now that you have seen what skills product managers should have, see how they put those skills into action to design powerful products—plus, see what visual templates you can use to elevate this role. The best products solve an acute problem. But no matter how revolutionary, a product is only as good as its value to the people who will use it every day. The best product managers always keep the end user in mind when they’re strategizing, building, refining, and launching a product. 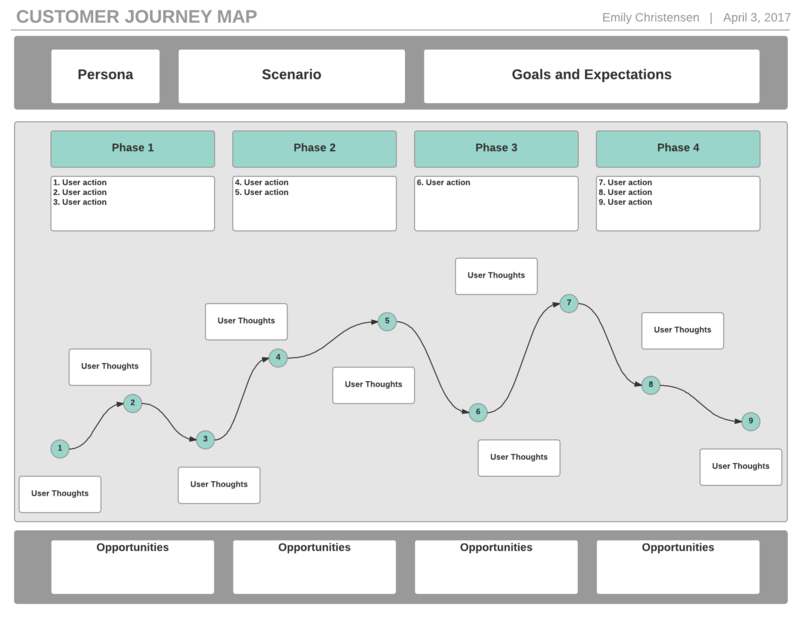 Customer journey mapping can help product managers understand where users are coming from and how they expect to interact with your product across every channel and touchpoint. Product managers should also ask for continuous feedback. Keeping the line of communication open ensures decisions aren’t being made in a vacuum, and the focus is always on creating the best possible product. Time is the most valuable asset for a product manager. You can’t buy more of it, and successful product managers make sure they gather all project requirements and dependencies before they kick off any work. To do so, they map out requirements, dependencies, processes, and everyone who needs to be involved to get a product off the ground. Failing to do so can result in duplicative work, missed deadlines, or scrapping projects entirely. Product managers know that it isn’t enough to come up with an excellent idea—you have to get feedback from designers and engineers and then convince stakeholders that your suggested change or new feature will benefit users. Effective communication and collaboration skills will help ensure that all the right inputs are considered in the development process. Product managers also ensure that feedback and requests are seamlessly integrated into their product planning and development processes. However, it isn’t enough to be a visionary. Successful product managers need to demonstrate the practical skills to bring big, complex ideas to life. It’s equally important to communicate the product plan to your larger organization in a clear, concise way. 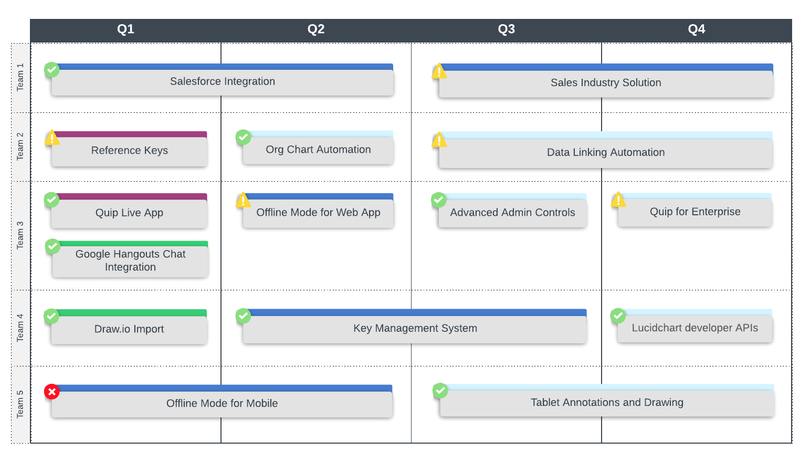 Product roadmaps are a good way to outline the strategy, features, and share your progress and future-looking product vision to internal and external stakeholders. Wireframe and mockup tools also make it easy to design, share, and test your ideas and get buy-in early in the product development process. Designing powerful products requires multi-faceted and talent product managers who can think big but also thrive in the details. The right innovative tools can help you get from concept to launch quickly and efficiently. 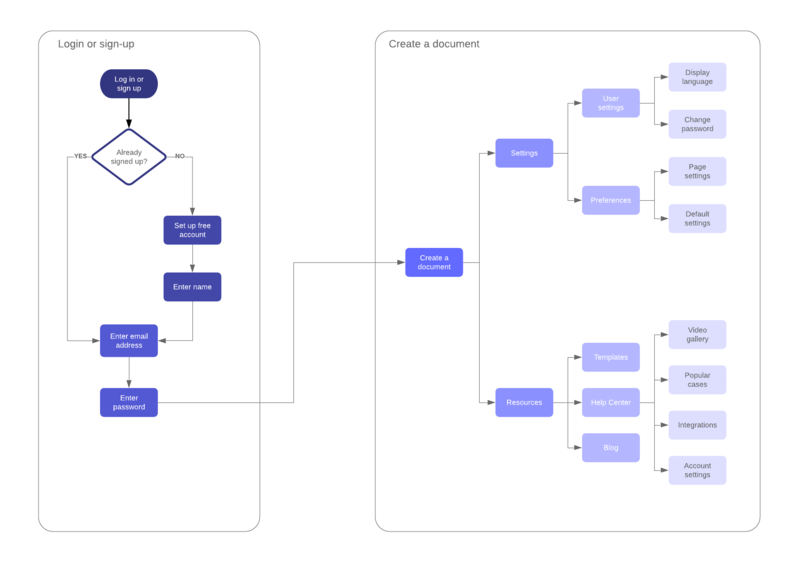 Lucidchart offers several templates and diagrams to help you build product roadmaps to show stakeholders what the engineering teams plan to build and how they are progressing, as well as user flows and low-fidelity mockups to show engineers and UX designers how the product should function.